Immediately following the death of Steve Jobs in October 2011, book publishers world wide started releasing a plethora of books about the much revered CEO we simply knew as Steve. I, Steve: Steve Jobs In His Own Words is one of these books. Whilst I personally don’t agree with publishers cashing in on the death of someone famous, this book was given to me as a gift and it turns out to be an interesting read, that is, if you like reading quotations and excepts from speeches. This collection of Steve-isms is collated and edited by George Beahm, and delivered over 169 pages and five key chapters. Chapters are divided into Quotations, Milestones, End Of An Era: Steve Job’s Resignation Letter, and Citations. The introduction is sadly lacking any substance and does little to give readers an adequate appraisal of the man upon whom the book is based on. With that complaint aside, we need to remember this is not a biography of Steve Jobs. There are a significant number of quotations and arguably this makes up the main context of the book. Interestingly, they are not collated by date, but by alphabetical faux headings for each quote. The headings do allow the casual reader to gather an idea about the upcoming text, but I would have preferred to see this content simply presented in chronological order. In direct contrast, the Milestones chapter is delivered chronologically. Beginning with the birth of Steve Jobs, through to his death, readers will be presented with valuable summaries of the major events that transpired in the specific year referenced. It would have been nice for this chapter to follow the Introduction chapter. I feel it would have better helped readers reflect on the Quotations chapter. When Steve Jobs resigned as CEO in August, 2011 his resignation letter to the Apple Board of Directors was made public. It is replicated word for word and allocated a chapter to itself. Whilst, this was a major milestone for Apple, the book is based on Steve Jobs and I fail to see the relevance of dedicating a chapter to it. The Citations chapter merely lists the online and offline sources for the quotations mentioned throughout the book. Anyone wanting to know much more about the visionary that was Steve Jobs will find this section a treasure trove for additional exploration and discovery. Overall, the book sufficiently delivers quotations and milestones from the man who was an inspiration to millions around the world. More care could have been taken with the introduction, and quotations should have been delivered in chronological order. 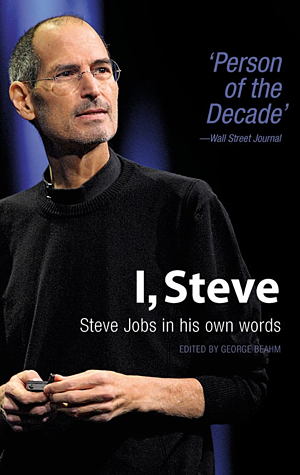 I, Steve: Steve Jobs In His Own Words is an affordable gift for someone with an interest in Steve Jobs. Therefore, I am awarding this book a MyMac.com review rating of 6 out of 10.